Edited by Kay Marner and Adrienne Ehlert Bashista ; Foreword by Dr. Edward Hallowell.Feb, 2012. 344 pages, ISBN 978-1933084152. Book Depository: Free international shipping! and through Follett, Ingram, and Brodart for bookstores and libraries. If there’s anything the 32 parent-writers and 15 experts of Easy to Love but Hard to Raise want you to know, it’s this:YOU ARE NOT ALONE. We’ve been there. We’ve done that. We’ve navigated the system. Some of us succeeded. Some failed. We’ve been judged by friends, teachers, family, & strangers. We’ve gotten the phone calls & the looks. We’ve done things we never thought we’d do, good & bad. We’ve been up nights, cried in our pillows, and screamed in frustration. We’ve doubted ourselves, our children, & our partners. We’ve had to educate everyone, including our children’s doctors. We are parents of children with alphabet soup diagnoses, invisible special needs, behavioral problems.Our children are easy to love, but oh, so hard to raise. 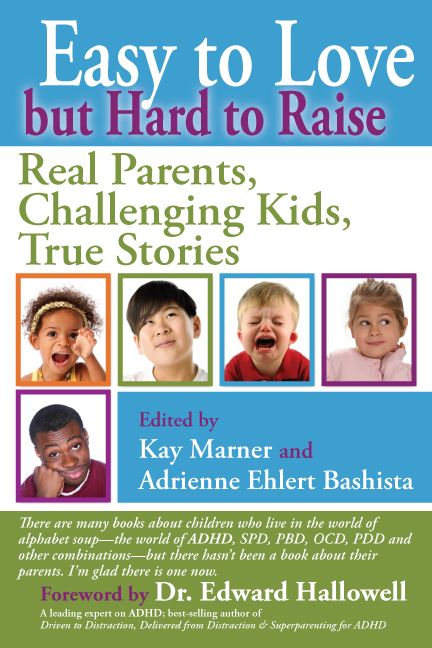 Easy to Love but Hard to Raise is an anthology of personal essays written by parents of children with ADD, ADHD, OCD, PDD, ASDs, SPD, PBD and/or other alphabet soup diagnoses that takes the already difficult job of parenting and adds to the challenge. These essays focus on honest feelings, lessons learned, epiphanies, commonplace and extraordinary experiences. They are written by parents of toddlers, young children, teens, and adult children; those who are in the parenting trenches now, and those looking back on their parenting experiences. 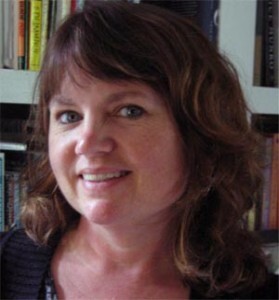 Topics include : how children came to be diagnosed, the experience of dealing with problem behaviors in various contexts and settings, experiences with/feelings about treatment (therapies, medications, alternative treatments), school (and other advocacy) experiences, children’s social interactions/friends, and the effect of parenting a difficult child on a parent’s emotional and physical health, marriage, and other relationships. If the topic of this book speaks to you, please read more from our contributors on our blog, Easy to Love but Hard to Raise or join the discussion on our Facebook page. “…This remarkable book will land emotional punches to your heart and soul. Coeditors Kay Marner, a writer and blogger for ADDitude and writer Adrienne Ehlert Bashista collected essays by parents of kids who are neurologically diverse. These moms [and dads] have cried in their pillows, screamed out in frustration, failed, and succeeded. I know how difficult raising a child with ADHD and other challenges can be, but rarely have I read a book that acknowledged the day-to-day difficulties in a way that gripped me. I, too, have wrestled with these struggles. Parents of challenging children are frequently scorned and accused of being bad parents who escape their difficulties by feeding their children psychotropic medications to tame their behaviors. Interestingly, the majority of parents in this book waited years before accepting the suggestions of doctors to start medication. “In Easy to Love but Hard to Raise parents raising children with challenging—and invisible—mental and behavioral disabilities find an outlet to share their personal stories of overwhelming frustration as well as treasured moments of small triumph. While resources on invisible childhood disabilities are vast—the collection of new studies, treatments, and discoveries continues to grow each year—resources that focus on the parents who rear these children are harder to find. Told in first person by a collective of parents, these personal essays pinpoint the difficult experiences that are unique to parents of children who exist in a world of “alphabet soup”—where a child can be labeled with a litany of confusing disorders that require treatments that are rarely uniform and straightforward. While the disabilities range from the well-known ADHD, Asperger’s syndrome, and autism to the lesser-known diagnosis of sensory integration dysfunction, the focus of all these essays is on the experience of parenting these children, not on the disability itself. For this reason, the book functions effectively as a support network for parents. Divided into six chapters, the stories in this collection cover a diverse assortment of issues. Each narrative is perceptive and well written, pinpointing sensitive, often intangible issues that will ring true for other parents seeking solace and a sense of community. A number of the essays, for example, touch on the emotional challenge of reconciling the haphazard reality of raising a “difficult” child with the sentimental image of mothering as intuitive and natural. These parents lack the comfort of knowing that the inevitable challenges of parenting—tantrums, disobedience, tears—can be met with firm, tried, and true parenting methods. Coming to terms with a reality vastly different from the norm is a running theme throughout this book.